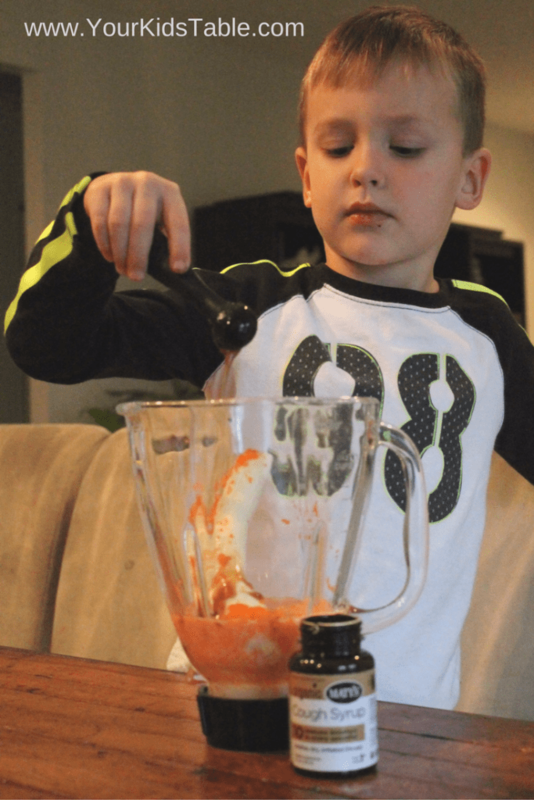 Fight back against the germs with this delicious and easy super immune booster smoothie recipe that’s perfect for kids too. This is a sponsored post, all opinions are my own. It’s that time of year again… cold and flu season. Boooooo! But, honestly, it seems like its always cold and flu season around my house. Between my three kids someone always seems to be sick and spreading it to someone else, and while I used to have the immune system of a strong ox (before kids), my sleep-deprived mommy body also usually succumbs to whatever bug has infiltrated our house! 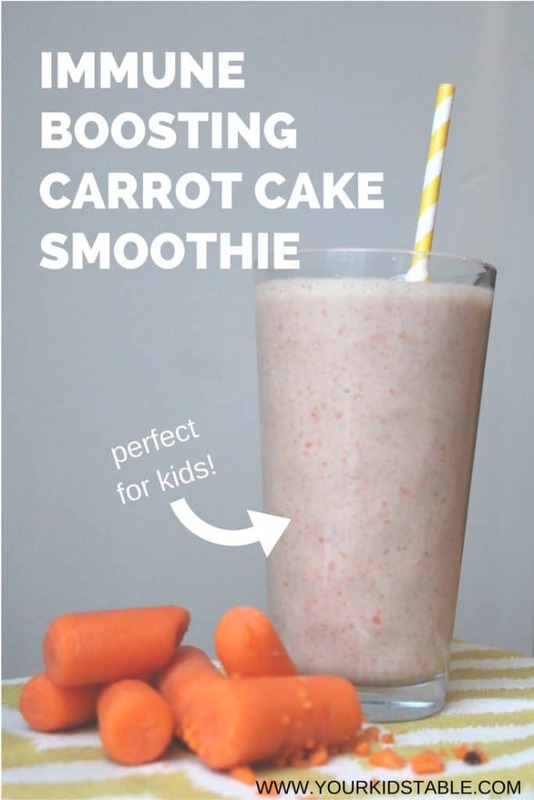 If you’ve been here before, you may know that I do try to focus on keeping my family’s immune system as strong as possible, and that’s why I’m sharing a special immune booster carrot cake smoothie recipe that will help your kids fight off the germs they are constantly bombarded with. Maty’s Healthy Products is just as passionate about building healthy immune systems, and I’m thrilled to have them here again sponsoring this special post. I truly am personally a big fan and regular user of their products. I especially love Maty’s Organic Cough Syrup because it’s 100% natural and safe for kids to take, over the age of 1. But, what really makes their cough syrup awesome though is that it includes 10 immune boosters! I kid you not, in the last few months, several times I felt a cold starting, or saw one starting in my kids, and after taking the cough syrup we were nearly fine the next day! I really do love this stuff, and because it’s all natural, you can take it any time for immune support. You can check out all of Maty’s Healthy Products by heading to their site here. 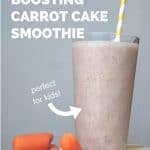 Maty’s also generously shared this awesome immune booster carrot cake smoothie recipe with me, so that I could share with all of you! Every ingredient was selected because of the immunity power it has. While this recipe is great for your kids (and you!) when you are getting sick or already sick, it’s just as wonderful to use anytime to keep your immune system going strong. Of course, we gave it a test run in our kitchen and my kids loved it! Because there are chopped raw carrots in it, I was expecting my middle son, who can be sensitive with different textures, not to drink more than a sip or two, but I was wrong because he loved it. I will say (because I can’t help but share a picky eating tip) that he helped me make this smoothie. This was important because it’s so helpful for picky eaters to see what’s going into blended and mixed foods. That way they know what to expect. I also let him know in advance that there would be small pieces of carrots he could taste when he drank it, that way he wouldn’t be surprised and would know what to expect, that can be a total game changer with a picky eater. How to Make This Yummy Immune Booster Smoothie! 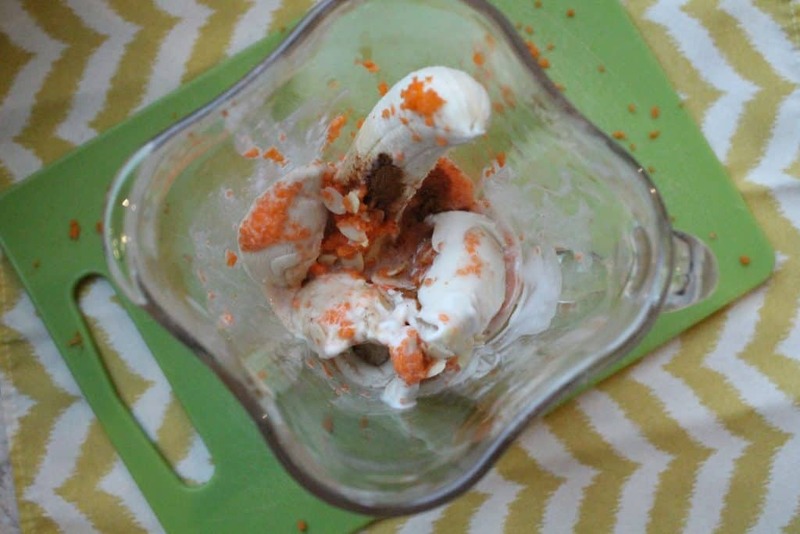 First, we chopped the carrots coarsely and then I pulverized them as much as possible in food processor. I don’t have a fancy blender, not by a long shot, so If you are lucky enough to own a Vitamix or some other high quality blender, the carrots in this smoothie might be totally pulverized, but in mine there were little carrot bits. It really didn’t matter though because it was delicious. Another option would be to cook the carrots first and get a puree when you blend them, but you will lose some of the nutrients in the cooking them. We then dumped in the banana, milk, nutmeg, ginger, cinnamon, vanilla, almonds… and frozen yogurt. I had some frozen yogurt on hand and it was a great fit, but that can be a little high in sugar. Feel free to use regular plain or vanilla yogurt as well. Heck, you could even freeze your own yogurt to give it that icy cold quality. Lastly, and most importantly, we put two teaspoons of Maty’s Cough Syrup in the mix to take this immune boosting recipe to the next level. Their cough syrup has a sweet taste, honey is one of the ingredients! Then, we used the blender to smooth-ify and voila, a tasty smoothie loaded with immune boosters done in minutes. Add all ingredients into a blender and blend until completely combined. If this is your first time making a smoothie, they are very forgiving. Add more flavors/yogurt to your liking! Want to try Maty’s? Enter for a chance to win one of their healing kits here! Be sure to check them out on Facebook, Twitter, Instagram and Pinterest too. Save this so you know where to find it, if you need it again!